This article submitted by Michael Jacobson on 10/11/00. Two new residents at the Koronis Manor have created quite a fuss, much to the delight of the other residents and staff. The popularity of these two comes in spite, in fact, because of their unusual behavior. One of the new arrivals tends to squawk, likes to get rides on the backs and shoulders of others, and has to be kept in a cage. The other arrival disturbs people in the middle of the night, sleeps in beds with other residents, feeds on lots of table scraps, and eats and rolls on the lobby floor. Normally, such behavior would hardly be the cause of praise and encouragement, but Chuckles and Dusty are special. Chuckles is a cockateel, and Dusty is a cat. Dusty visits Frances LaCroix in her room every day and Frances has treats has Dusty every time she comes. What they are helping to do is put the home in nursing home. The pets have made the environment less sterile and more home-like, said Lynn Lange, a recreational therapist who works in the recreation department in the Manor. "It is their home," she added. "They are pretty much going to spend the rest of their lives here." Pet therapy is not new at the Koronis Manor. Staff members have brought dogs and cats and other pets to visit for years. The difference is now Chuckles and Dusty are full-time residents, too. The Manor has had an aviary for several years, where residents can watch and hear a number of species of birds. "(Residents) hardly ever go outside, so they never get to hear the birds sing," explained Lange. Residents keep such a keen eye on the aviary that they know when birds are sick, when they lay eggs, and when the eggs hatch. Janet Thompson feeds Dusty from her food tray. Having a pet, though, is a step up from the aviary. With Chuckles and Dusty, the residents can not only see and hear the animal, they can feel it. When Chuckles pecks on Phil Melby's beard and neck, Melby shrugs off any discomfort. "He's an independent cuss, just like me," Melby said. Plus, Dusty and Chuckles are mobile, so residents confined to their rooms can enjoy these critters, too. "The bird fell into our lap. Because a family felt they were working too much and weren't paying enough attention to it, they gave it to us," said Fahlberg, who had brought her dog for visits for years. Chuckles arrived at the Manor in June. 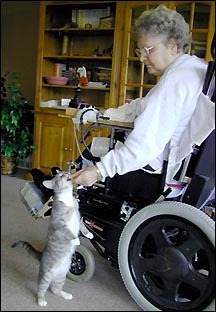 Another staff member, Nancy Young, a nurse's aide, used to bring cats to visit. She donated Dusty, who came in July. "It's such a wonderful cat," said Lange. "We were lucky to get it." The benefits have been significant in just a few months. "We were talking the other day how the residents, and staff, are more relaxed since the cat came," said Lange, who was on maternity leave when Dusty arrived. She has noticed a huge difference in attitude since her return. Lange was astounded when a resident who has trouble remembering listed things about the pets. And she's seen a taciturn resident speaking to them. "Truly amazing," she said. "That's the kind of impact it has." The pets have helped combat loneliness, helplessness, and boredom, according to Lange and Lou Ann Fahlberg, an occupational therapist at the Manor. "We always noticed this with pet visits, Ébut it's very different now," said Fahlberg. "With the pet here on a daily basis, there's more of an attachment." For instance, if a resident is feeling restless and bored, petting or playing with Dusty can put them at ease. Petting Dusty has also been used to comfort a family whose loved one was rather sick. Melby lets Chuckles (pictured above)out of the cage for around an hour a day. "He's got to have someone to visit him, just like me," he explained. "I come see him at night and hear him when he makes noise and wants attention," he added. Other residents have taken on responsibilities in caring for the pets, like giving Dusty a bath. Feeding him is definitely a group effort. Whoever said that a cat can't be trained should check out Dusty's routine. He's a regular visitor to Frances LaCroix's room in the early morning for a treat and again after breakfast for leftover meat. "I have more food than I can eat, so I save some for her," Frances explained. At noon, Dusty gets more scraps from Janet Thompson while she eats her lunch in the lounge. "When she sees my chair," said Thompson, "she makes a beeline for it." One day, Thompson was sick and didn't come, so Pam Engan, a nurse's aide, wheeled her chair to its usual spot and sat in it herself. "(Dusty) kind of looked at me like, ÔYou're not the right person, but if you feed me, I'll stay,'" recounted Engan. The staff can always locate Dusty by opening the treat jar in the lounge, its sound brings Dusty running. Before the pets arrived, there was some apprehension about caring for them, but Lange and Fahlberg reported that it has been easier than expected, thanks to a team effort. The nursing, housekeeping, and recreation staff have helped to care for the pets, as well as residents, who do more than feed them. Staff throughout the Paynesville Area Health Care System held a bake sale to support the pets. Over $300 was raised, which went for veterinarian expenses, food, and equipment. "There's nothing better that they could have done," said LaCroix about the pets. Having been around cats her entire life, she enjoys seeing Dusty's eyes light up when he recognizes her in the hall. She says seeing a small child struggle to carry Dusty Ð with an arm around the cat's waist while its head and tail flop Ð is the "cutest thing." Thompson enjoys seeing the cat play hide and seek with itself in the lounge. "I like to watch her play with her stuffed animals and think she's funny when she plays with the yarn," Thompson said. 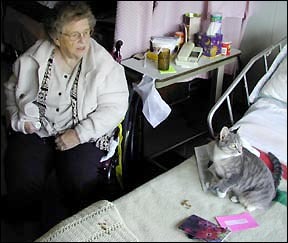 The pets' influence has been great enough to impact visitors to the nursing home. Lange reported that it makes it easier to bring children to visit their elderly relatives. Now, while the adults talk, the kids can amuse themselves with Dusty or Chuckles. "It gives our visitors something to do,"Êsaid Lange. "Kids love it, and the residents love to watch the kids play." About the only regret is not having had pets in the nursing home sooner. In the future, it's hard to imagine not having them, and the staff might consider more.